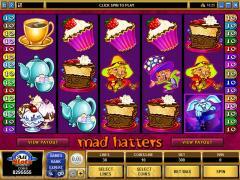 Mad Hatters is a unique slot game that is designed and developed by Microgaming, the world's acknowledged kingpin in the development of online casino gaming software. The game stars the Mad Hatter himself (or various versions of him), at a tea party, with five reels, a whopping 30 paylines, and a maximum bet of 300 coins. 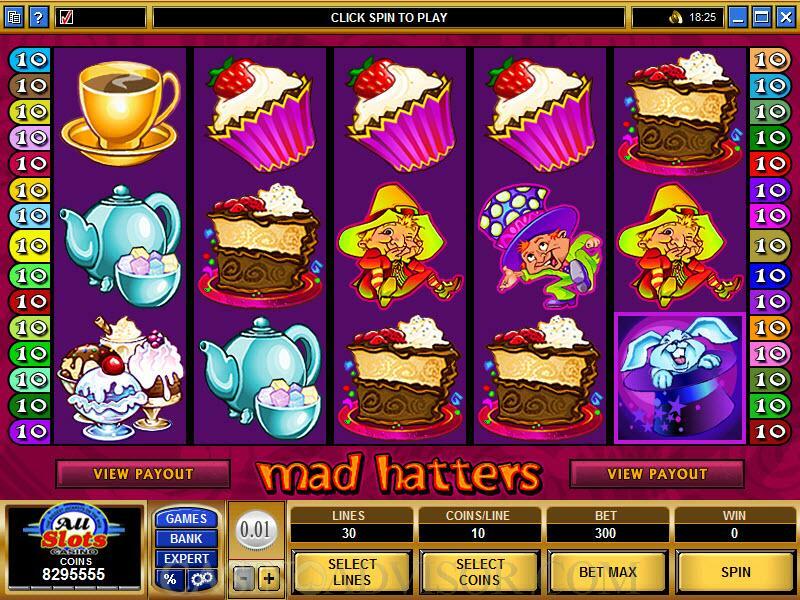 Mad Hatters has a wild (the Mad Hat, of course) and a scatter symbol (the Bunny), and they are obviously factors in paying out the larger jackpots and qualifying the player for bonus games. 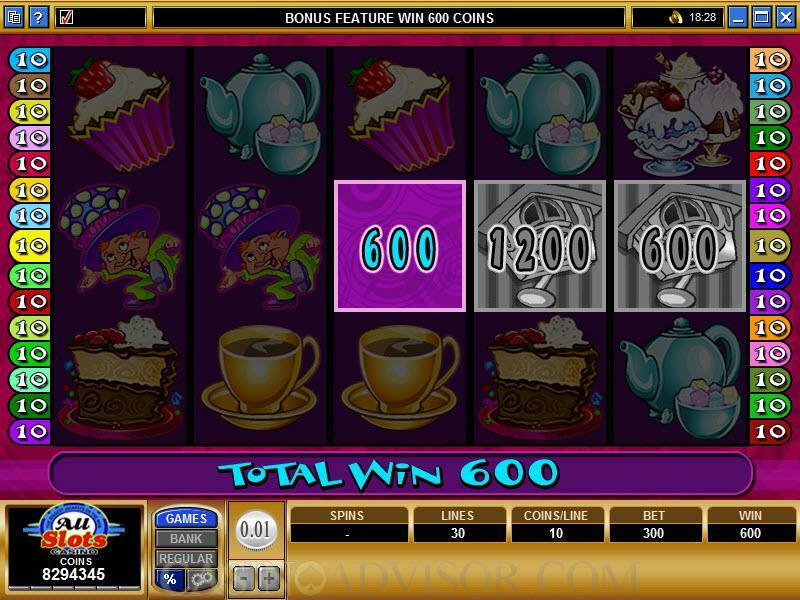 Things get underway rather easily in Mad Hatters, starting when the player clicks the "spin" button, and controls that are at the bottom of the interface facilitate selecting the number of coins put into action and the number of paylines that will be enabled. With ten coins maximum and 30 paylines available, you can put a pretty big bet out there. Coin denominations are not necessarily all that extensive, as they go from .01 to .02 to .05 to .10. If you want to bypass all of that and bet the maximum possible, simply click "Bet Max." You can see the payout tables simply by clicking "View Payout," which is easy to see at the bottom of the reels. If you do that, you'll see that there is a "Cuckoo Bonus" which is activated when at least three Cuckoo symbols appear anywhere on the reels. The Cuckoo Bonus can pay up to 11,100 coins, and that is the second highest single payout in Mad Hatters. 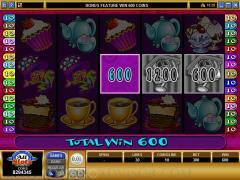 Also, there is Free Spins Bonus Game. When three Bunny symbols appear anywhere on the reels, it will trigger ten free spins for the player. Four Bunnies brings 25 free spins, and five Bunnies will trigger a high of fifty free spins. This is a very strong total of spins. Once in the Free Spins Bonus Game, you've got an opportunity to select one of the Mad hatter symbols (John, James, Jeff) as an "expanding wild." This means that if it appears on Reel 3, it will serve as a wild to complete winning combinations. Interested in reading more detailed information about Mad Hatters? If so Click Here for more details.